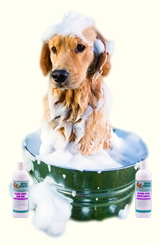 We're pleased to announce that we're now selling a wonderful range of natural dog shampoos that treat a wide variety of skin disorders experienced by dogs. The brand is Nature's Specialties and they're a family-based business that manufacturer the shampoos right here in the US. Nature's Specialties use all natural ingredients that are kind and gentle to the skin, yet are medicated so contain anti-itch, anti-fungal, antibacterial and antimicrobial properties which aid in the relief of many skin problems. You'd be surprised at the number of common skin conditions that can be prevented and treated if the right shampoo is used. You can find more information on the shampoos and skin conditions treated here. Is It Allergies Or Yeast? As the weather starts to get warmer you may notice your dog itching and scratching more. It may be allergies, but did you know that the culprit may also be due to yeast? Yeast thrives in hot and humid weather and is often misdiagnosed as allergies. Click here for more information on how to determine if your dog is in fact suffering from yeast and how you can treat this. You can find more information on dog skin allergies here. You Can Test & Treat At Home! I found a few easy ways to test your dog for ear mites yourself as well as a simple remedy that you can perform at home. And yes, once again it is a natural cure. If your dog is shaking her head or scratching her ears, you can find out if it is ear mites that is causing the itching and treat that, or, at least you can eliminate mites as the cause. Find out how here. After much research, I've finally finished my e-book on how to attend to many common problems dogs...naturally. 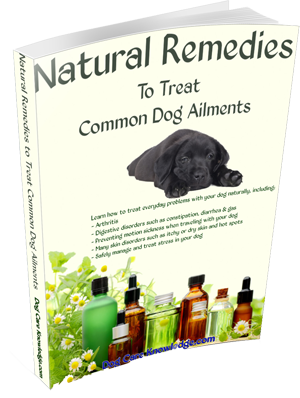 'Natural Remedies To Treat Common Dog Ailments' covers issues such as managing the symptoms of arthritis as well as how to treat a wide range of skin disorders, a lot of the time with everyday stuff you'll find in your cabinets. For those of you that didn't receive your free copy on sign-up, you can download your free copy here.